A woman who says she is employed by Coast to Coast Auto Glass was arrested this week in Hernando County, Fla. Jenna Parslow, 21, is charged with committing criminal mischief to two vehicles, and for possession of drug paraphernalia, according to reports from the Hernando County Sheriff's Office. According to the complaint filed against Parslow, at 3 p.m. on Tuesday, September 29, a witness allegedly observed Parslow standing near two particular vehicles, a 2008 Nissan and a 1996 Honda; at one of her stops near the vehicles, the witness alleges that Parslow "pulled her hand away from the area of the windshield, which was damaged." "The defendant then approached the owners of both vehicles and offered to have their windshields repaired at no cost to them," reads the arrest report. Both vehicles are alleged to have been parked in the same parking lot, approximately 50 feet apart, for 10 minutes, and the witness claims Parslow was the only person to have been near either vehicle. The vehicle owners "both attested [the damage] was not there when they parked their vehicles 10 minutes earlier," according to the report. Officer Julio Tagliani, who filed the arrest report, says that both vehicles had chips approximately ¼ inch in diameter; the Nissan had two chips of this size. "All three chips were identical in shape and size, and were consistent with being struck by a sharp object," adds Tagliani. Parslow advised the sheriff's department she makes $45 for every windshield she refers to Coast to Coast, but denies damaging the windshields, according to the report. Tagliani also searched Parslow's purse, and allegedly discovered a "glass smoking pipe with marijuana residue." 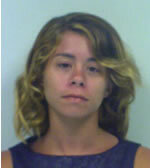 She was arrested with a bond of $750 and has a court date scheduled for October 28. Company spokesperson Jigna Patel had not responded to requests for comment at press time. Please stay tuned to www.glassBYTEs.com/AGRR magazine for more information as it becomes available.